Home Blogs Will Automatic Emergency Braking Become Standard in School Buses in 1-2 Years? Will Automatic Emergency Braking Become Standard in School Buses in 1-2 Years? Is the looming arrival of automatic emergency braking (AEB) becoming a standard feature in school buses only a year or two away? That may, in part, become true, judging from the growing adoption rate in consumer passenger vehicles. Related: Could Technology Make Motorists #Brake4Buses? 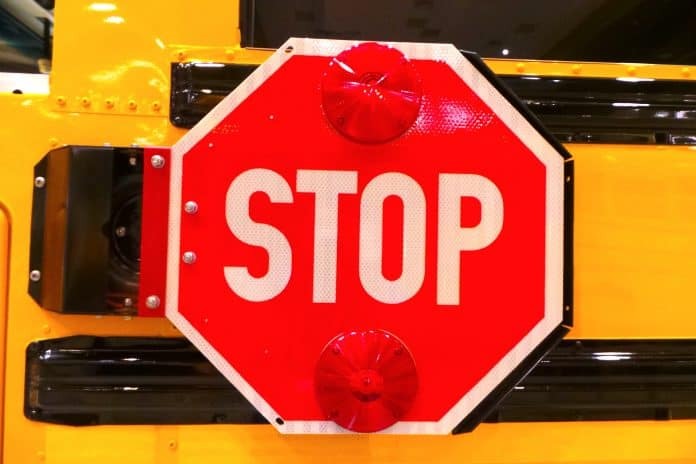 The National Transportation Safety Board last year called on the National Highway Traffic Safety Administration to require AEB for school buses. But you may be surprised at the number of passenger vehicle manufacturers that are already including AEB, and how many have begun adding more advanced capabilities, such as pedestrian detection, another emerging technology being seen on school buses. Tesla vehicles, for example, have already reached 100 percent adoption. The future may be in the process of arriving next year, if you believe a joint announcement that was released on March 13 by the National Highway Traffic Safety Administration (NHTSA) and Insurance Institute for Highway Safety (IIHS), reprinted below. You can also email me your brief comments, for inclusion in a follow-up column that discusses adoption of AEB in the school bus market. Ten automakers report equipping more than half of the vehicles they produced between Sept. 1, 2017, and Aug. 31, 2018, with automatic emergency braking (AEB), NHTSA and the IIHS announced. This is the second update of manufacturer progress toward equipping every new passenger vehicle with the crash avoidance technology by September 1, 2022. The 10 manufacturers include many high-volume automakers, such as Honda, Nissan and Toyota. Three manufacturers—Mercedes-Benz, Tesla and Volvo—report 93 percent or higher conformance with the voluntary commitment, with Tesla at 100 percent. Based on reporting by the 20 manufacturers that made the commitment, about half of the vehicles produced during the period were equipped with AEB. This is an increase from less than a third for the previous year, according to reports that included sales figures for both years. Toyota remains the frontrunner in terms of the total number of vehicles produced with AEB. The automaker equipped 2.2 million (90 percent) of its 2.5 million vehicles with AEB. Nissan has the second-highest number produced with AEB—1.1 million (78 percent) of 1.4 million vehicles. Honda is third-highest with 980,000 (61 percent) of 1.6 million vehicles produced with AEB. These data are reported as part of a voluntary commitment by 20 auto manufacturers to equip virtually all new light-duty cars and trucks with a gross vehicle weight of 8,500 pounds or less with a low-speed AEB system that includes forward collision warning (FCW) and crash imminent braking (CIB), to help prevent and mitigate front-to-rear crashes. Brokered in 2015 by NHTSA and IIHS, the commitment is intended to get the safety technology into the vehicle fleet faster than requiring it via a federal rulemaking. Manufacturers submit yearly progress reports to the public docket until they fully conform to the voluntary agreement. Consumer Reports supported the commitment and agreed to assist in monitoring automaker progress. IIHS estimates that the commitment will prevent 28,000 crashes and 12,000 injuries by 2025. AEB systems with both FCW and CIB reduce rear-end crashes by half, while FCW alone reduces them by more than a quarter, IIHS research indicates. “Getting AEB on the road as soon as possible was the main aim of the commitment, and this latest report shows that a significant proportion of vehicles left the factory with AEB on board,” says David Zuby, executive vice president and chief research officer of IIHS. NHTSA, IIHS, and Consumer Reports credit manufacturers for honoring the commitment. There is room for improvement. Fewer than 10 percent of vehicles produced during the reporting period by Ford, Mitsubishi and Porsche were equipped with AEB. Jaguar Land Rover didn’t report any vehicles with AEB conforming to the commitment. According to additional data tracked by Consumer Reports and IIHS, 13 of the 20 manufacturers offer AEB as standard equipment on all trim levels on at least half of their 2019 models. Inclusion as standard equipment ensures all consumers interested in a new vehicle will get this important safety technology. The participating automakers include: Audi, BMW, Fiat Chrysler, Ford, General Motors, Honda, Hyundai, Jaguar Land Rover, Kia, Maserati, Mazda, Mercedes-Benz, Mitsubishi Motors, Nissan, Porsche, Subaru, Tesla Motors, Toyota, Volkswagen and Volvo. These companies represent more than 99 percent of the U.S. automobile market. For details on the voluntary agreement, reports from manufacturers, and model information, visit the public docket at www.regulations.gov, docket number NHTSA-2015-0101.